This past week my family went with some church members to pass out food and water in an area of our city that had been struck by a tornado. A policeman escorted us because we were in some areas where he wasn’t sure how we would be received. A church member commented that walking door to door in an unfamiliar neighborhood must be easy for me since I’ve lived overseas. My husband and I have been involved in cross-cultural ministry in different capacities and settings for about 15 years. It is fun, exciting, and rewarding. It often makes me uncomfortable. It exposes my sin and helps me grow in compassion and grace. It shows me where I cling to earthly treasures and traditions. It is so good, but I would never say it is easy for me. My son was three years old the first time he was offered alcohol. We were sitting in the living room of a Roma home in Skopje, Macedonia where we had lived for nine months. Our hosts had invited us to join them for a family party celebrating the pending circumcision of their five- and nine-year-old boys. I had noticed a few children with their own cups of beer and some adults laughing about it. I was in the middle of a conversation with a friend when I saw a 10-year-old girl put her cup of beer up to my son’s mouth. When we minister in cross-cultural contexts, we are going to face the brokenness of the community. All ministry can be dangerous, but when you step into another culture, you often don’t know exactly what risks you might face. We do well to remember that all cultures–even our own–have a problem with sin and have their own false gods. The familiar sins and idols of our own culture can feel safe and comfortable, but they are no less dangerous to our families. I face the temptation of thinking that everything that is different from my own culture is indicative of how a host culture is broken. Sometimes though, we have to carefully sort out what is sinful and what is just different. 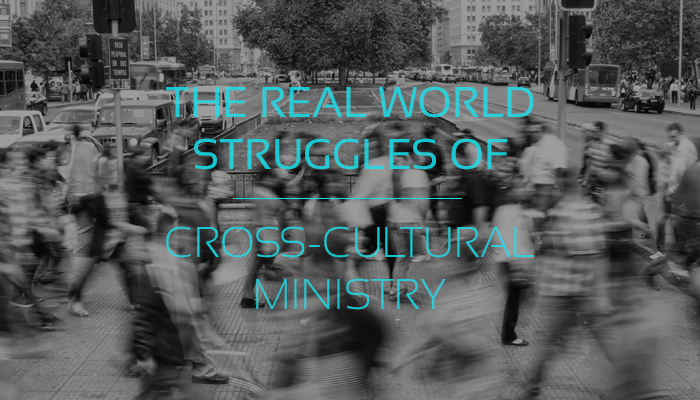 Many frustrations with cross-cultural ministry can come because of the differences that we just don’t like. These differences come out in areas of life that I didn’t understand until I was fully immersed in a foreign culture. Our culture affects the way we think and how we express ourselves. Arts, values, and traditions vary from culture to culture, affecting the tastes and opinions of people across the world. I remember always feeling scared for the unsupervised Roma children I saw around Skopje. They weren’t playing in their fenced-in yards like my American children did; they had the freedom to roam their neighborhood and beyond without anyone knowing where they were. My American sensibilities looked down on this aspect of Roma parenting. I didn’t realize that my Roma friends were looking down on my parenting at the same time. One day when my husband and I strapped up our children into their car seats, our friend Fatima was perplexed as she watched. In Macedonia where we lived, there were no laws requiring children to use car seats. “So, they can’t get out at all while you’re driving?” she asked. Fatima thought our practice of using car seats was restrictive and even unloving, and I saw her culture’s habit of allowing children freedom to roam around as unwise and unsafe. No amount of explaining could have changed the other’s mind that day. While ministering cross-culturally can expose differences that could hinder relationships, sometimes we have to rest in what makes us more alike than different. Even though my friend could not understand my thinking about safety and risks, she understands a parent’s love for her child. People need no common language or background to understand many aspects of life. Love is universally understood, as is grief. Every person understands the need for provision and the desire to belong. We can be very different while being quite similar. Spiritually, we must remember that regardless of differences in cultures, we are all sinners in need of the redemptive work of Jesus on the cross. If we lose sight of this purpose, we’ve lost the reason why we step out of own culture to minister to others. Additionally, we must remember that there is no hierarchy of culture or race or ethnicity when we come before God (Gal. 3:28) and that all people are made in the image of God (Gen. 1:27). Because of this, we must approach other cultures humbly, recognizing that they have a lot to teach us and offer us. If you come over to our house, I’m probably going to try to feed you a lot of food, my husband will make you an amazing cup of coffee, my kids will give you some sort of gift, and you'll be walked to your car by my family when you leave. We learned about hospitality from our Roma friends in Macedonia, who–though they are very poor–welcome people into their homes like no one else I've met. They give their guests the best everything–the best seats, the best food, the best drinks. Hospitality is a part of daily life for them. A neighbor can walk over to a friend’s home at any time knowing that they'll be invited in to visit and drink coffee. The Roma know something that most of my middle-class American neighborhood doesn’t. They know that people matter, that we were built for community, that homes are meant to welcome people. Being welcomed into Roma homes has changed how we think about hosting people in our own home. My African-American friends have taught me about worship. They don’t have some of the stiffness of the predominantly white churches I’ve attended. They come to God with hearts that want to celebrate Him with an expression that helps me worship better. Both of these cultures share a high value of extended family and have been instructive to me, making my life richer as I seek deeper relationships with my family. If your city is like ours, walking around downtown gives you a small glimpse of the nations. The diversity that we see in people and cultures within miles from our house reminds me that the world is huge and its people are varied. When I meet people from other cultures, I love learning about their lives. I find it fascinating to hear about who they are, what has shaped them, and what is important to them. Listening to other people’s stories always reminds me that regardless of our differences, Jesus is sufficient for our salvation. We are all united in our need for the risen Savior. God promises to redeem people from every culture. Revelation 7:9 says, “After this I looked, and there before me was a great multitude that no one could count, from every nation, tribe, people and language, standing before the throne and before the Lamb.” What a beautiful thing that will be to behold. This is why we minister cross-culturally: because Jesus has called people from each end of the earth–and everywhere in between–to salvation through Him.